Let's start with the story, which takes place some time after the Amazing Spider-Man movie. The basic premise of the story is that a bunch of cross species have gotten free from Oscorp and it's sorta Spidey's fault. It's now up to you to stop them, all while finding a cure for the disease that they are spreading around the city. There is a bit of depth and dimension in the story as Spider-Man struggles against the cross-species and Oscorp, who is also out the get the cross species--him included.The story is good but is easily forgotten and the dialog is hit and miss at times. Pacing wise you can do all the main missions one after the other with a few exceptions but overall the story manages to keep you invested throughout the ten plus hours of playtime. Let's move onto gameplay which offers a mixed bag. 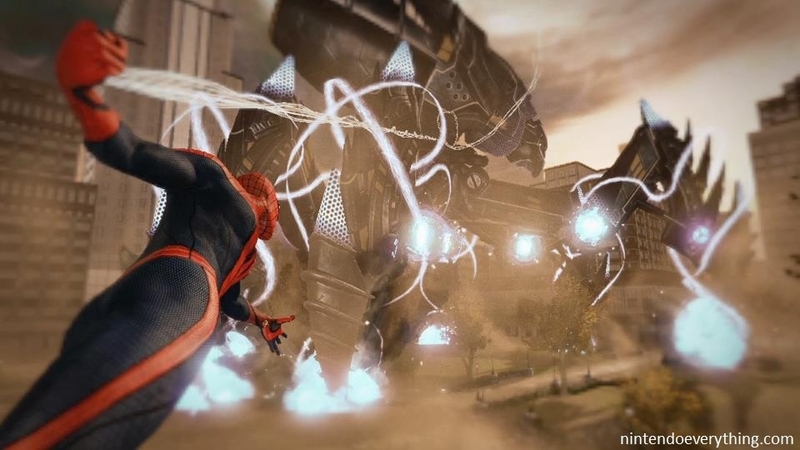 This is the first open-world Spider-Man game that Beenox has done so some elements can be a bit jarring while others impressive. Web Swinging around the city is fun and immersive thanks to the new pulled in camera that Beenox uses. However, at times you lose that sense of realism when your web latches onto thin air as you zip to a location. What saves web swinging is the new Web Rush mechanic, which lets Spidey pull of a flurry of acrobatic moves as he moves from one point to another. It can also be used contextually to zip to enemies, specific environmental spots (especially indoors) and objects within the environment that can be used against your enemies. Combat tries to emulate what so many have done before but doesn't quite hit the mark set by Batman: Arkham Asylum. What you get is one button combat that doesn't flow, a counter system that often fails and enemies that require little effect to overcome--unless vastly outnumbered, then it becomes somewhat frustrating. The inclusion of stealth takedowns does little to change the gameplay. It can become grating after seeing the same stealth takedown animation so many times. One thing I have to give credit to Beenox for are the finishing moves that Spider-Man performs, they are both brutal and stylish--really showing off how acrobatic spidey really is. Ah New York City, how is it that your city crimes don't seem so random. 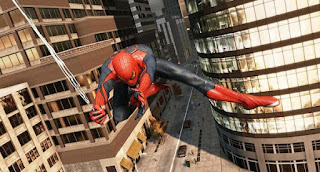 Swinging around the city you'll notice a variety of crimes to stop and events to undertake. Crimes range from your standard muggings and car chases to assisting police standoffs and secret Oscorp labs. On the other hand there are the challenges; Photo challenges, Race and Camera challenges, and collectibles in the form of comic books and humans. The latter of which have to be ferried back to a set location. These city crimes and challenges are just boring, repetitive fillers to keep you busy between story mission. Additionally once you accomplish all the crimes and events in the city you have to do the story mission before more show up. After you've finished the game and webbed up every collectible and crime you're just left with a big open city with nothing to do. The Amazing Spider-Man doesn't hit any high notes but manages to climb above other movie tie-in games, if by a slim margin [although some may argue about it being a movie tie-in]. 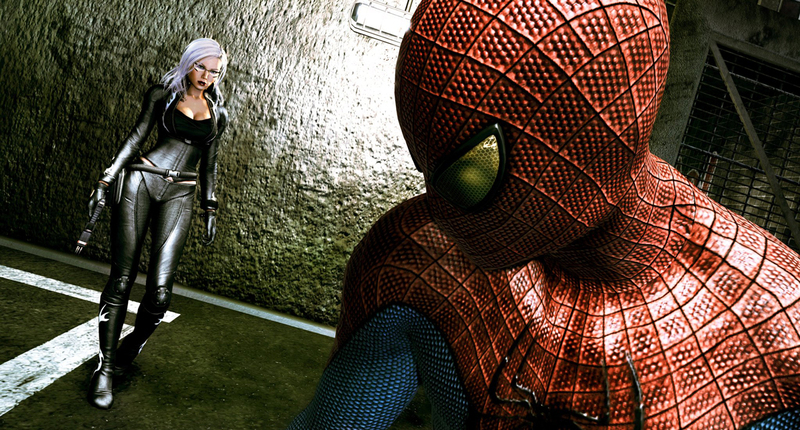 For their first outing into an open world Spider-Man game Beenox did a few things right and wrong. Web Rush and the over-the-shoulder camera, right. A majority of the story levels indoors, wrong; scripted city crimes, wrong; invisible web swing and zip points, wrong. I'm not here to sell the game short but half of what Beenox has done really takes what it means to be red and blue spandex wearing walk crawler and tosses it. Of course this is just my opinion and everyone is entitled to their own, my hope is that this experience leads Beenox to produce something truly spectacular for the next Spider-Man game.